Beveridge & Diamond welcomes Randy Hayman, former DC Water General Counsel, to our Washington, DC, office as a Principal. Randy, who served since November 2010 as the General Counsel of DC Water, the municipal water agency for Washington, DC, brings significant experience with corporate transactional matters, environmental and land use permitting, litigation, and regulatory compliance and enforcement defense. Providing legal support for the world’s largest Thermal Hydrolysis Combined Heat and Power Project – the first in North America – at the Blue Plains Plant that harnesses the wastewater treatment process to generate a net 10MW of electricity – providing 1/3 of the plant’s energy needs, resulting in savings of $10M - $15M annually in energy costs. Successfully representing MSD in matters involving personal injury, property damage, environmental issues, construction issues, environmental and safety compliance, human relations and labor issues, and collection matters. 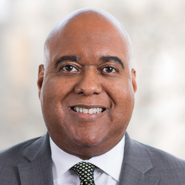 Randy currently serves as the Co-Chair of the American Bar Association’s (ABA) Minority Trial Lawyer Committee, and he has served in leadership capacities on several bar and community organizations, including as Co-Chair of the Corporate Counsel Committee of the ABA Section of Litigation and as the Co-Chair of the Corporate Advisory Board of the National Bar Association. He also served on the Board of Directors of Washington, DC, and St. Louis Crime Solvers, and on the Board of Directors of the Herbert Hoover Boys and Girls Club in St. Louis. The Washington Business Journal presented Randy with its Minority Business Leader and Legal Champion awards in 2014.